There are lots of one-off apps for iPad – a synth here, an effect there. zMors is something else: a complete modular patching environment. And that doesn’t just mean putting some virtual patch cables onscreen. zMors does MIDI input. It works with hardware modulars (via audio and control voltage). And now, it adds Inter App Audio for use with other apps – and it loads Pd patches. That’s right: you can put a modular patching environment inside your modular patching environment. Load a Pd patch from your computer into zMors, and combine it via other modules. That looks simply amazing for live performance. 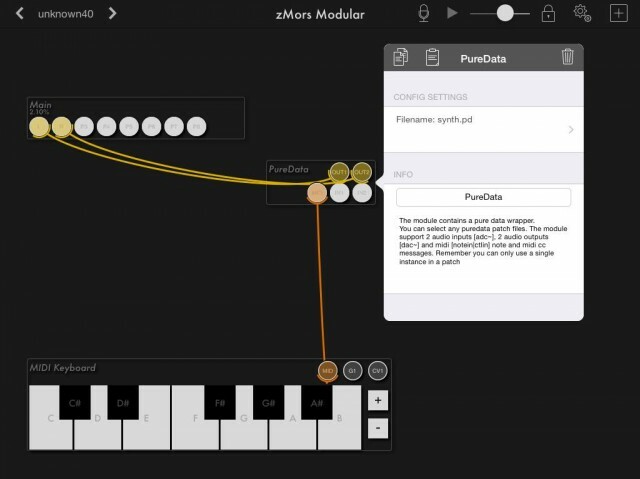 With the version released last week, zMors has added MIDI sequencing, a sampler, a MIDI filter, a motion module for making CV signals for outputs, a physical modeling (Karplus-Strong) oscillator, iCloud support (which is how you’ll load Pd patches), recording into WAV, Bluetooth MIDI support, and more. If you know how to use Pd – even as far as downloading the odd patch – you know how to use the Pd bit. Pd patches work the way they always do, but here can be inter-connected with those other modules. You can thank libpd for making this possible – and, perhaps, ask why your favorite software doesn’t do something similar.